Whether you are a champion of sustainability or just want to gain a better appreciation of the environment, travel is a great outlet for it. 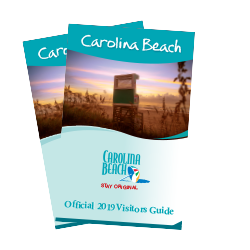 From decreasing your carbon footprint to uncovering natural wonders, here are ways to take part in sustainable tourism and eco-adventure at Carolina Beach. 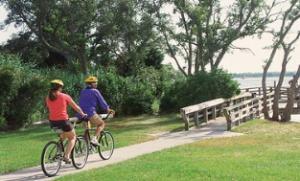 It’s easy to get around the island Carolina Beach calls home, no car required. Explore by bike – rentals are available at Wheel Fun Rentals’ two locations or at Carolina Beach State Park through Paddle NC. It will be even easier to explore the island on bicycle or on foot soon thanks to the Island Greenway Project, a 1.2-mile paved path around the island, along with several other bike and pedestrian projects in the works. For a more hands-on experience, Carolina Beach State Park recently installed one acre of a proposed five-acre inshore artificial reef just off the park’s riverfront shoreline. The artificial reef will enhance recreational fishing and create oyster habitats along the island’s coastline. 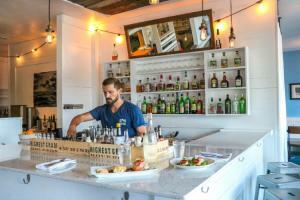 Surf House Oyster Bar & Surf Camp is recognized for its farm-to-table offerings, as well as local, sustainable seafood. Its menus rely on small, local farm involvement and sustainable regional seafood. The casual spot also offers surfing classes and group ocean outings. The nearby Veggie Wagon sources fruits, vegetables and homemade products from local farms and small batch producers. Show your support to restaurants recognized by the Plastic Ocean Project as Ocean Friendly Establishments on the island, including Ocean Grill & Tiki Bar, offering oceanfront views alongside fresh coastal cuisine; Shuckin’ Shack, named one of the “Best Seafood Dives in America;” and the pet-and family-friendly Lazy Pirate Grill, serving up signature dishes like Dixie Wings and stacked burgers. Nature’s creativity is all around at Carolina Beach State Park, home to 13 different habitats amongst its 761 acres. While hiking along the trails, you’ll find carnivorous plants like Venus Flytraps, which are rarely found growing natively in the United States, pitcher plants, sundews, bladderworts and butterworts. The park is also home to three major limesink ponds, each offering a different habitat for flora and fauna. Kayak Carolina offers daily rentals and guided tours of the surrounding areas, like the Zeke’s Island Family Adventure Tour or the Sugarloaf Dune Hike and Paddle. New Hanover County has nine sites on the N.C. Birding Trail. Mahanaim Adventures in nearby Wilmington offers Birder Kayaking Adventures to Carolina Beach State Park, nearby Fort Fisher Basin and Zeke’s Island Reserve where bird species likely to be seen include great egret, white ibis, bald eagle, great horned owns – the list goes on. Campers can get back to nature at Carolina Beach State Park’s recently upgraded campgrounds or Freeman Park, where you can camp right on the beach when you obtain a permit. 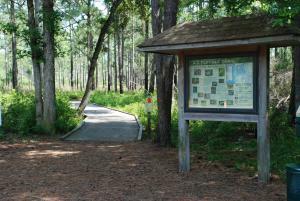 Carolina Beach State Park offers nature hikes and educational programs featuring the park’s unique habitats and ranger-led programming, such as carnivorous plant hikes and star-gazing parties. The visitor center also features environmental education exhibits. 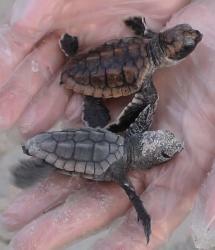 The Pleasure Island Sea Turtle Project is dedicated to preserving and protecting all sea turtle species. The group is composed of volunteers who patrol the beach, cover and protect nests, dig trenches to the ocean and guide hatchlings through the trenches once they are ready for their journey. The non-profit offers Turtle Talks throughout nesting season (May through September) at several island locations. Or you can lend a hand to the volunteers on the beach during your upcoming trip.